Local elected officials hailed Mayor Bloomberg’s pick of a black schools chancellor with a history of being involved with public schools but remain skeptical that the new hire will be his own man. That after Cathie Black, the publishing executive who Bloomberg picked to head city schools, resigned after little more than three months and the mayor hired Deputy Mayor Dennis Walcott to replace her. “The resignation of Cathie Black represents an extraordinary public acknowledgment by City Hall that her appointment did not serve the best interests of our public school children,” said Assembly member Hakeem Jeffries, who filed a lawsuit to stop her appointment. Jeffries said many parents and community stakeholders remain skeptical about the Department of Education (DOE) and its policies, but the appointment of Walcott is a significant step in the right direction. But he also warned that if Walcott does not demonstrate any reasonable independence from City Hall, he would also encounter his fair share of critics. “The job of a deputy mayor is to be loyal to the mayor; the job of a schools chancellor is to do the right thing for our children, even if that means disagreeing with a mayoral position,” said Jeffries. City Councilwoman Letitia James said she congratulates Walcott, but if the DOE policies do not change everything remains the same. “He (Walcott) is obviously charming and accessible and engaging, and that makes me feel warm and fuzzy, but unfortunately that’s not enough,” said James. James said the Bloomberg Administration continues to rely on high- stakes testing, the co-location of charter schools in overcrowded public schools and the possible layoffs of over 6,000 teachers. “It is very troubling that the focus is on the last in-first out layoffs of teachers and that takes away from the inequities of state money, and the Bloomberg Administration’s support to not extend the millionaires tax. That money would have gone a long way in averting layoffs and addressing fiscal inequities in the school system,” said James. City Councilman Al Vann said Black lacked just about all of the characteristics and qualifications to be the chancellor of the school system, so her removal was in everyone’s best interest. 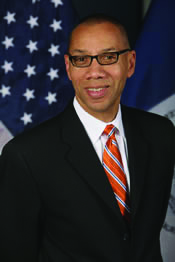 “While it is encouraging that the mayor has chosen a replacement who is in touch with the needs of our community, it remains to be seen whether Deputy Mayor Walcott will move the DOE away from dictating decisions to parents and communities and towards true engagement where stakeholders have input and influence in decisions that will affect their children and communities,” he said. City Councilman Charles Barron said Walcott should be an interim appointee and there should be a search for a more qualified chancellor that includes input from community stakeholders. “Walcott may be more personable than his predecessor, but this is not about personality change, it’s about policy change. With all his expertise in education, Walcott still doesn’t meet all the requirements to become chancellor,” said Barron. State Sen. Velmanette Montgomery said she is “so very much looking forward to working with Dennis Walcott,” and refused further comment. Assemblywoman Annette Robinson did not return several phone calls at press time with a response. Next article"Shame On Every Elected Official"